The apartment is located in the attic of a detached family house. We landlords (a family of 3, father, mother and 9 year old son) live in the EC and the 1. Floor. The cozy 1-room attic studio has a spacious leather sofa in the living area, from which you can watch TV on the large flat screen (cuddly pillows and blankets are available). The sleeping area is equipped with a 180 cm wide bed (well-kept bed linen) with a view of the mountains. THE APARTMENT IS CONNECTED TO THE WATER GRANDER. In the spacious bathroom you will find time to relax, whether in the corner bath or in the shower with integrated massage jet. Bathrobes, enough towels and bath towels are included. In the mornings, the Balcony overlooking the fields for breakfast on the evening of the balcony overlooking the mountains to the glass of wine. Protected carport (closed to 3 sides) available in front of the house for a fee, otherwise there are enough parking spaces on the street. The apartment is equipped with various articles, z. Coffee and filters, sugar, tea, various spices, napkins, Zewa, garbage bags, aluminum foil, cotton pads, soap, shower gel, shaving foam and much more. The apartment has been extended with 2 dormers, the fall to the sleeping area is a bit lower and the door to the bathroom is also a bit lower. For larger people like to hook. Washing facilities: In the basement there is a washing machine and a dryer, these can be used for a fee (5,00 Euro / use). From 7 o'clock on the welcome day a small welcome greetings, varying from flowers, drinks or fruit awaits you. IF YOU ANOTHER HOLIDAY FOR 2 PEOPLE SEARCH, TAKE A LOOK AT THE OBJECT OR 756 105 for 2-4 people OBJECT TO 2,181,004. The bathroom has a corner bath and a shower with massage spotlights. Bathrobes (from 7 nights) available. It is very spacious and has a great view of the mountains. In the basement is washer and dryer, these can be used for a fee. Per unit 5.00 euros. Detergent 0.50 euros. We had a great stay in this sweet Bavarian apartment. It is conveniently located on a nice street not far from the center of town. The apartment is the top floor of the owners home. It was clean, bright and the kitchen was fully stocked. The bathroom is modern with a lovely soaking tub and a stand alone shower. There are two nice balconies with stunning views of the surrounding mountains and grazing cows in the distance with their bells ringing. Daniella, the homeowner was super sweet and helpful. She left some fruit, nuts and wine for us as well as Garmisch passes. That was so thoughtful. I highly recommend staying here! We certainly will if we ever return to Garmisch. Dear Carla, thank you so much for your very good review. I am happy that you have enjoyed your stay that much. We stayed with Daniella for 7 nights, mid summer. The flat is very well appointed, with everything we needed. We cooked light diners a few nights, and the kitchen had everything we needed. The bathroom was super nice and the entire flat was like new. The location was great, walking distance to PartenKirschen pedestrian zone, and a short bike ride to Garmisch's pedestrian zone. This is really a nice place to stay and I highly recommend it for any visit to GaPa. We have just returned from a memorable two week stay in this beautiful and superbly equipped apartment. Daniela has thought of everything you could need to make your stay comfortable, and I mean everything! Many thanks to her and her family for their very warm and generous welcome and for making us feel so much at home. 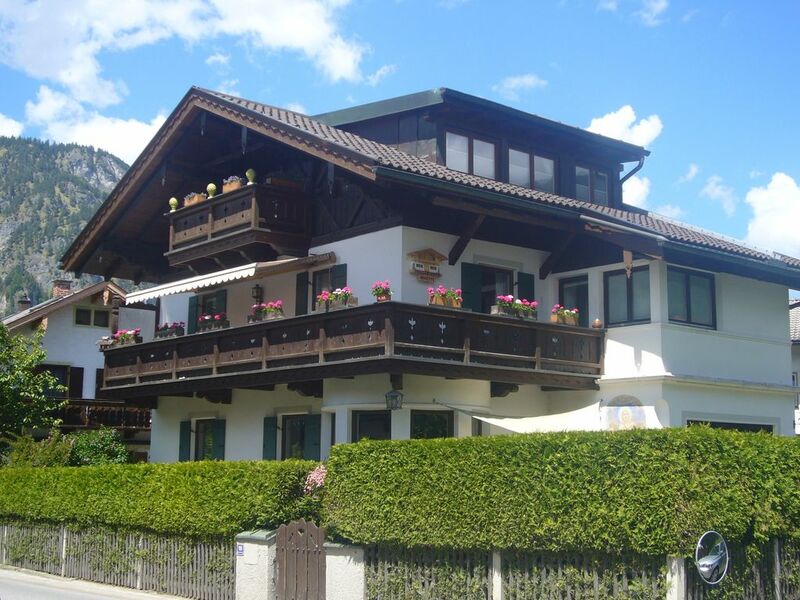 Garmisch-Partenkirchen is a lovely town and the apartment is in a quiet, residential street and just a short stroll from so many of the shops, restaurants and sights. There are so many great walks directly from the apartment and it is not too far from the railway station if you wish to visit the Zugspitze or indeed other beautiful areas of Bavaria or Austria. The photos do not exaggerate how good this charming apartment is and if I could I would give it 6 stars! thank you, thank you, thank you so much for your great comment and your visit at our place. Maybe we can welcome you some time again. If it had been located a few streets over, I could have said 'Perfect in Partenkirchen'. I'd never before thought of my house as a shabby dump until returning from my stay in this apartment. If I ever return, I intend barricading the door and claiming squatters' rights. The apartment was incredibly light and bright and well equipped, and unless you were minded to make your own pasta whilst on holiday (I was determined to find something missing from the kitchen), you'll find everything you need and more besides. Despite the cold, we sat out on the balconies gazing at the mountains (binoculars provided). The views aren't uninterrupted, as the apartment is in a quiet residential area (you could hear a pin drop it was so quiet). Shops (including two supermarkets)/restaurants were a mere 7-10 min walk away. If you're arriving from England on a Sunday, be aware that the shops (not restaurants) will be shut and therefore you might want to stock up with essential provisions (ie milk/wine/beer) at the supermarket in the arrivals hall at Innsbruck. Condiments, cooking oils, washing up liquid and bin-liners were supplied (we have stayed in apartments before where the owners have been so tight that there's no so much as a bottle opener - thank god for strong teeth). The bathroom was gleaming, with a fab bath to wallow in. The super-duper shower cubicle was a bit of a tight squeeze for a fat boy (Husband. I had to prize him out and got soaked in the process). Tons of fluffy towels and two colour-coordinated bathrobes. The bathroom does not afford total privacy without closing the blinds. I don't like shutting out light, but the only other options were knackering my knees and back trying to crouch/stoop to below window level when using the facilities, or being arrested for indecency. The beds were incredibly comfy and there was ample storage space and hangers in the wardrobe. My husband and I are both 5' 9" and needed to duck to avoid the beam which separates the bedroom area. I didn't find this a problem at all, but my husband cape a cropper several times. The noise of bald pate against brick resounding round the apartment like a gong in a Tibetan monastery. Still, as I'm determined to come back, I've told husband that a dented cranium adds character and that the blinding lights of semi-consciousness is something some can only achieve by paying considerable sums of money for illegal substances. GAP is lush, by the way, just like the apartment. All you need to bring is yourself; this place has it all and is beautifully furnished with gorgeous views. A short walk to the middle of town that has everything you could want. Owners were very kind and easy to deal with. Will stay here again next time in Germany! thank you for the kindly comment about our apartment. We are happy you liked it here and in garmisch. Hopefully we can welcome you again. Charming, comfortable, light-filled, modern, elegant, inviting, immaculate,...and the list goes on. We wanted for nothing!, and were quite amazed at the thoughtful attention to detail given by the owners. The entry foyer not only provided a place for outerware and shoes, but also housed walking sticks, umbrellas, and an assortment of felt slippers for guest use. When our host opened the door to the apartment, a welcome of fresh flowers, wine, chocolates and a bowl of fresh fruits awaited us. A binder of helpful information and emergency numbers was in plain sight, and Frau Koch walked us through the mechanics of the sound system, the coffee maker and appliances; all that we would need to know to make our time in the studio comfortable and special. When we tore ourselves away from the studio, we found it was all about location. We could walk to the Kurpark, to the Marienplatz, to restaurants...Wildschütz, Alpenhof..., cafés...Krönner..., shops, bakery. We could walk, stroll, wander a myriad of paths along the Loisach, to the Riessersee, or through meadows, the Partnach gorge. If we wanted to travel out of GaP, we walked to the Bahnhof and took a train to Oberammergau, Mittenwald, Munich or Innsbruck. Two weeks simply were not long enough. Rather than a "homeaway", we felt as if we had " come home". The warmth and welcome extended by Familie Riedel-Koch, the thoughtful attention given to the comfort of the guest, the charming studio apartment, the location and natural beauty of GaP and area all made this Homeaway our best and most amazing experience ever! My husband and I would highly recommend this property. We thank you, Frau Riedel/Frau Koch and family. We are already counting the days until we return next year. I really want to send a big THANK YOU for this wonderful recommendation. Jetzt schreibe ich auf Deutsch um bessere Worte zu finden. Noch nie hat jemand eine so ausführliche und grandiose Bewertung geschrieben. Ich freue mich sehr und habe ein breites Lächeln im Gesicht. Es war eine wunderschöne Zeit mit Ihnen im Haus und wir ALLE freuen uns heute schon wieder wenn wir Sie nächstes Jahr im September begrüssen dürfen. Ben wird täglich ein besserer Fire Fighter, er hat so viel Freude mit dem Outfit und seiner Feuerwehr - Fotos werden folgen. Seit heute renovieren wir wieder (neuer Boden im gesamten Appartement, neue Badtüre, zwei neue Balkontüren und ein neues Küchenfenster), damit für die kommende Saison wieder alles tip top ist. Jetzt wünsche ich Ihnen alles Gute und eine schöne Zeit in Mexiko. Come and enjoy your vacation in our cozy attic apartment with 2 balconies amidst beautiful mountain scenery. It is centrally located in the district of Garmisch near the attractive pedestrian area with many shops and restaurants. In 5 minutes you reach the park, the Richard-Strauss, Mohren- and Marienplatz, just as the DB and the Zugspitze train station. An ideal starting point for hikers, mountain bikers, cross country skiers and skiers - mountain railways very close. Cosy top floor living room with sofa, cable TV and DVD. The kitchen is equipped with an oven with ceramic hob, microwave, refrigerator, freezer, dishwasher, Alessi capsule coffee machine, filter coffee maker and kettle. The sleeping area with a double bed 180 * 200 cm. The bathroom has a shower with back spotlights, with a corner bath, a wash basin and toilet. Golf: The 9-hole golf course Burgrain is located approximately 3 km away, the 18 hole golf course of Oberau in around 10 km away. Ski: You can Hausbergbahn, which is located about 3 km away or use the Kreuzeck- and Alpspitzbahn located about 6 km away. The 3 ski resorts are connected by ski trails. Bei Stornierungen versuchen wir die Fewo weiterzuvermieten, sollte dies nicht möglich sein, erlauben wir uns 100 % in Rechnung zu stellen. Aus diesem Grund ist eine Reiserücktrittversicherung zu empfehlen. Schlüsselübergabe findet am Objekt statt, deshalb muss der Vermieter über die Ankunftszeit informiert werden. Kurtaxe 3,00 Euro/Tag/Erwachsene und 1,00 Euro/Tag/Kind (6-16J.) wird vor Ort berechnet. Parkplatz: 3-seitig geschlossener Carport 5 Euro/Tag, ansonsten genügend Parkplätze an der Strasse vorhanden.